Not so long ago a video of a flock of starlings swooping and swirling as one body in the sky went viral. Only two minutes long, the video shows thousands of birds over the River Shannon in Ireland, pouring themselves across the clouds, each bird following the one next to it. The birds flew not so much in formation as they flew in the biological equivalent of phase transition. This phenomenon of synchronized bird flight is called a murmuration. What makes the murmuration hypnotic is the starlings’ seemingly uncoordinated coordination, a thousand birds in flight, like fluid flowing across the skies. But there’s something else as well. Something else about the murmuration that appeals to us at this particular moment, that helps to explain this video’s virality. The murmuration defies our modern understanding of crowds. Whether the crazed seagulls of Hitchcock’s The Birds, the shambling hordes of zombies that seem to have infected every strain of popular culture, or the thousands upon thousands of protestors of the Arab Spring, we are used to chaotic, disorganized crowds, what Elias Canetti calls the “open” crowd (Canetti 1984). Open crowds are dense and bound to grow denser, a crowd that itself attracts more crowds. Open crowds cannot be contained. They erupt. A murmuration is not an open crowd. It is not quite a closed crowd either. A closed crowd is bounded and permanent, while a murmuration is an instantiation—a rhythmic, ephemeral flash. The murmuration in the video is an idealization of the crowd, transforming it into a thing of beauty. Even the word itself is sublime, a murmur that goes on to become something else entirely. Murmuration might be this generation’s cellar door, supposedly—as the novelist Don DeLillo once recounted with skepticism—the most beautiful string of syllables in the English language (Begley 1993). And like the avian phenomenon it describes, this poetic word contrasts sharply with that unpleasant onomatopoeic word we use to describe something else that flies in the sky but which is rarely seen. An MQ-1 Predator Drone. Courtesy of U.S. Air Force. The long ‘o’ following by an even longer ‘n,’ an alveolar nasal consonant that sounds like a humming without the ‘m.’ A low threshold background noise, ubiquitous but unlocatable, like object it describes. Vaguely insect-shaped machines, armed with laser-guided missiles, drones have become the Obama administration’s chief tactical weapon in its counterterrorism operations. 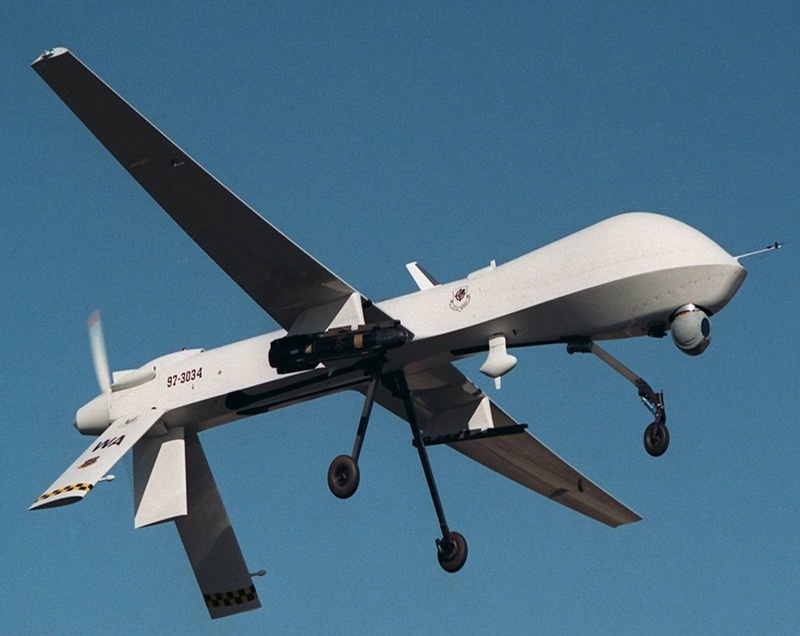 Before the Predator and the Reaper, both made by General Atomics Aeronautical Systems, a drone was more commonly associated with the male honeybee, whose sole function is to fertilize the queen bee. The Oxford English Dictionary suggests that the bee, not the sound, is the origin of the word, and it dates back to 1000 AD. Only later, in the 16th century would the word become associated with the sound. And how did drone—as we use the word today—come to mean what the U.S. government calls “remotely piloted aircraft”? The earliest example the Oxford English Dictionary gives is 1946 in England. It is a reference to remote controlled planes, likely because of their simplistic, mindless function, which recalls an earlier use in Britain of “drone,” slang for a “non-worker; a lazy idler, a sluggard.” This meaning of drone suggests that modern unmanned drones are purely mechanical, the anti-crowd. The Predator and Reaper drones are not automatons though, no more than any bird in a murmuration. These unmanned aerial vehicles (UAV) are controlled by a crew comprised of a remote pilot and a sensor operator, working side-by-side in a ground station, hundreds, even thousands, of miles away from the battleground. Many of the drone sorties flown in Yemen and Somalia, for example, are controlled by pilots at Creech Air Force Base in Nevada or Holloman Air Force Base in New Mexico (Whitlock 2012; Shoemaker 2012). 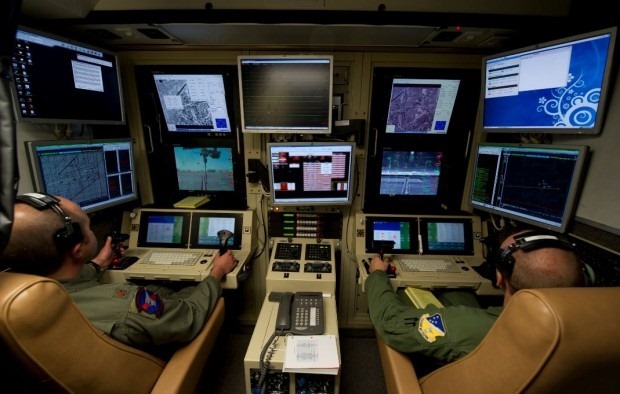 In an Air Force photograph of a training mission at Holloman Air Force Base, we see an MQ-9 Reaper pilot and sensor operator wedged into their cramped control room, surrounded by no less than fourteen screens, a joystick in the pilot’s right hand. The remote cockpit is a jarring mismatch of technology. The drone itself is loaded with full motion cameras, infrared sensors, and other sophisticated gear, but the hardware in the control station is an eighties shade of PC beige, and the recliners look to be leftovers from an office supply store fire sale. The room is windowless and appears claustrophobic, perhaps even more so than the cockpit of an F-16. “If you’re in the F-16, at night, in the weather, lightning around you and St. Elmo’s fire coming up on the cockpit, all that stuff is affecting you right now,” reports one California National Guard drone pilot, stressing the psychological impact of visual access to the outside world. “Whereas,” he continues, “if you’re sitting in the ‘cockpit’ of the UAV, you don’t have those external influences on you, so you don’t feel quite as threatened as you might flying though a thunderstorm in an F-16” (Prawdzik 2007). The drone cockpit is detached from the outside world, almost monastic in its winnowing of perception and experience. And here we come full circle. Is not the idealized crowd we find reflected in the balletic flight path of the murmuration the precise opposite of drone warfare? We watched the murmuration video and shared it like good news because it transformed all the elements of drone warfare into a graceful dance. The mangled crowd of PTSD warriors and victims became a rapturous display of nature. The gleaming machines and their AGM-114 Hellfire missiles became a flock of warm-blooded birds dominating the sky by their sheer vitality. The terror of a drone attack from on high became the sublime sight of a murmuration. And the witnesses to a drone attack—the only consistent witnesses being the UAV operators themselves—became the two young women recording the murmuration video, and by proxy, us. The murmuration appealed to us because it met two forces shaping the contemporary world and from which most Americans are sheltered—crowds and drones—and combined and transmuted them. So that for a little while longer we can keep the other world—the world of darkness, destruction, and indeterminate humanity—at bay. Begley, Adam. 1993. “The Art of Fiction CXXXV.” Paris Review 35 (128): 274–306. Canetti, Elias. 1984. Crowds and Power. Translated by Carol Stewart. New York: Farrar, Straus and Giroux. Prawdzik, Christopher. 2007. “Airmen Warm to UAVs as California Establishes First Air National Guard Predator Mission.” National Guard Magazine, February. Shoemaker, Michael. 2012. “Predators, Reapers Break Flying Record.” Air Force Print News Today. October 15. Whitlock, Craig. 2012. “Remote U.S. Base at Core of Secret Operations.” The Washington Post, October 25. Haunting. This makes me think of Baudelaire’s visual idealization of the crowd in his portrait of the modern artist: “a mirror as vast as the crowd itself,” “a kaleidoscope gifted with consciousness.” This image captures all the “flickering grace” and diffuses the self-splintering shock by conceptualizing the crowd as an object of beauty. Anonymity is an added allure and the danger of the crowd, cloaking the artist and the assassin alike. I wonder if this connection speaks to you at all, in terms of anonymity/identified targets, visuality/aurality, or . . . ? Thanks for the thoughts!